Kauai Lagoons Hole 2: The front has three relatively short par fives, all of which provide good chances to score if a good drive is hit. This one is fairly wide-open on the tee shot, with the only real trouble being the large series of bunkers that sit on the right side of the 2nd shot and the green. The putting surface is wide, but very narrow with a low area over the green. Thus short irons played from the left are pretty easy, but holding the green with a long shot in is a more difficult proposition. Kauai Lagoons Hole 3: This tough par four has bunkers in the middle of the fairway, which essentially makes the space between that and the trees on either side not very wide. The second shot is uphill to a tight and contoured green surrounded by a lot of bunkers that will make for tough up and down pars. Kauai Lagoons Hole 5: A great and beautiful par 3 with a long carry over an enormous and deep mango forest (that the player gets to drive his cart down and through in an uniquely Hawaiian experience). Anything short will fall to its doom or be mired in one of two huge bunkers that also wrap around the left side of the green. There is a bail out area right, but it’s still a long carry over the jungle. The backdrop of the coastal Kauai mountain ranges and native flora make this hole as beautiful as it is fun and challenging. Kauai Lagoons Hole 6: A great Hawaiian par 5 dog leg right. The drive has a carry over another mango jungle and the farther right the drive goes, the longer the carry, but the shorter the second shot will be. This golf shot also brings the huge fairway bunker into play. However, if the drive is mastered, the green is relatively wide open and can be reached in two, although anything right is still either in a deep bunker (best case) or gone. Kauai Lagoons Hole 8: A tiny, downhill par three with a small green that is fronted short and right by a pretty little lake. Simple on paper, but the trade winds have a tendency to blow shots right into the water. The over-careful tee shot will leave a downhill chip to a green running away from the player. Kauai Lagoons Hole 11: One of the new holes, this par four is fairly straight but the fairway pinches in for longer drives. The green has a big bunker to the right and features a tier, making distance control key. Kauai Lagoons Hole 12: This is a short, dogleg left par four and the main goal here is just simply to avoid the bunkers. They are deep and turn a fairly simple hole into a real problem. The green is also raised and usually tough to hold, so distance control is very important, but played with a short iron or wedge, quite manageable. Kauai Lagoons Hole 13: This is where the course really begins to heat up with a long par four headed straight to the Pacific. 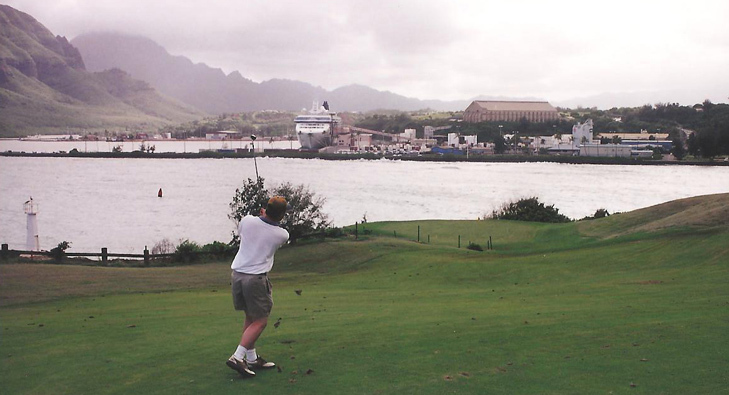 The downside to the hole is the proximity to the landing strip of the Lihue airport. While no drive could ever hit a plane, it can't get loud from time to time. The green is also tiered and tough to putt. Kauai Lagoons Hole 14: A world-class, beyond beautiful, one-shot masterpiece over a cove in the Pacific Ocean. Anything short or left will find the largest water hazard in the world. The green has a tier and the surrounding traps are plentiful. Very scary, but very fun, and a hole the player will never forget. Kauai Lagoons Hole 15: One of the new golf holes after the redesign, this par four has a bunker that general wisdom would stay to the right of. The player can fly it or go left, but if hit too far, it will run down the cliffs. The green is cut behind the coastal edge and a couple of deep bunkers and the downhill nature of the shot adds complexity. 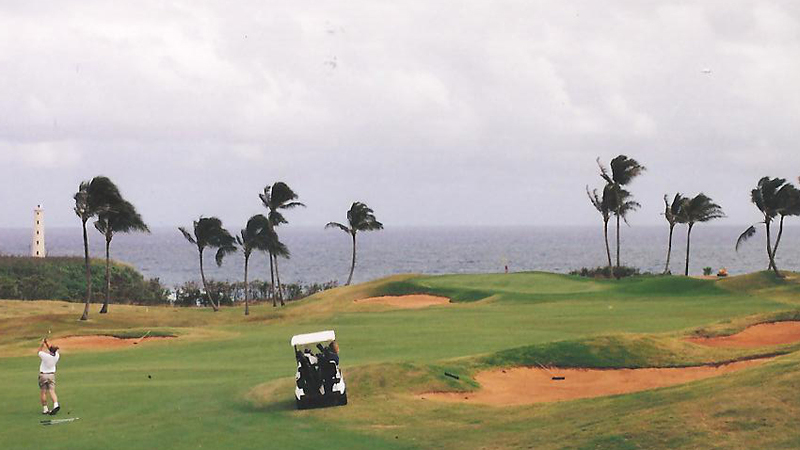 Kauai Lagoons Hole 16: Set on a lava peninsula by a lighthouse, the tee shot should be an iron hit about 200 yards. If pushed right, it will find a steep hillside, which will make the approach shot a lot more dangerous. However, if pulled, it will find the Pacific Ocean. The straight shot will leave a wedge to the downhill peninsula green with ocean short or left and a deep collection bunker behind. The green is rock hard and the ideal shot will find the right front edge of the green and collect to the middle. Chasing after a left pin placement is foolhardy and should never be attempted. The views are unparalleled and this is another hole on the Kiele course that won’t be forgotten. 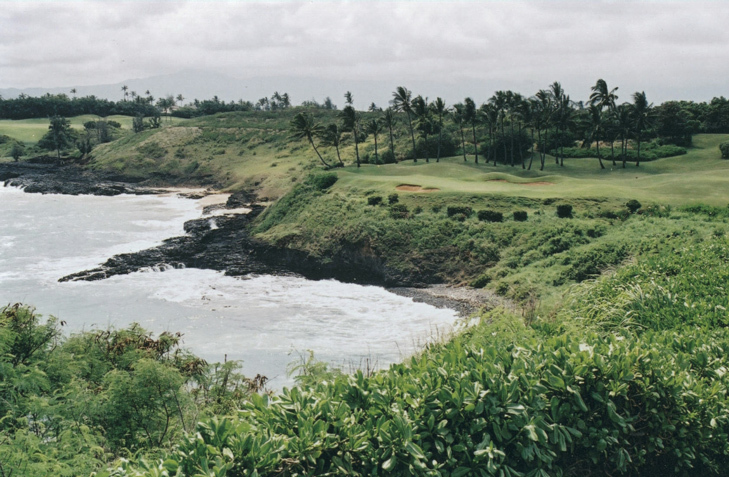 Kauai Lagoons Hole 17: A short peninsula par 3 into the prevailing trade winds. The green is very shallow and anything misjudged that misses the water will most likely catch the horseshoe shaped bunker that wraps around the right 50% of the green, but take enough club to stay dry. 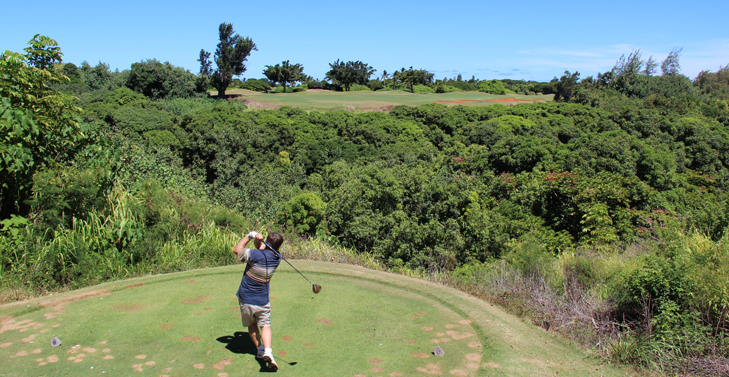 Kauai Lagoons Hole 18: A tough, but memorable finish to a great golf course. The drive on this 400+ yard hole must be hit well to leave a short shot to the island green, which is surrounded, not only by water, but by bunkers as well. Anything pushed right will find the water on the drive as well. 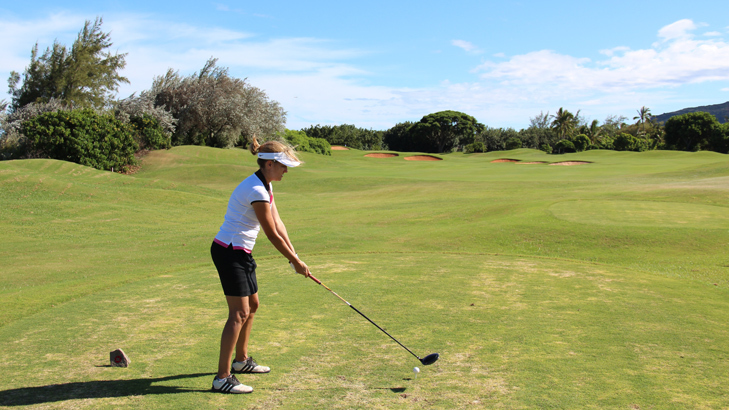 We've Reviewed All the Best Kauai Golf Courses. Info on the Nicklaus Golf Course Design of the Kauai Lagoons Golf Club - Kiele & Mokihana Courses. 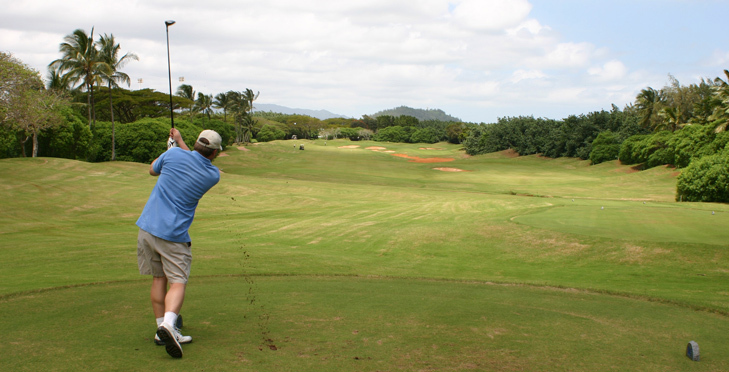 New management for the Kauai Lagoons Golf Courses.